A blend of herbs & pure essential oils for sore muscles & joints. Ingredients: Cayenne Pepper (40,000 H.U. ), Virgin Olive Oil, Oil of Wintergreen, Menthol Crystals & other pure essential oils as fragrances & Beeswax. There is nothing quite like an intense workout, round of golf or hike in the mountains to help us feel recharged but a day or two later we may feel stiff & sore. Sports, housework or any activity our bodies are not used to can cause backaches & sore muscles. Cayenne is the one of the purest herbal stimulant to increase blood flow for faster healing and temprorary pain relief. 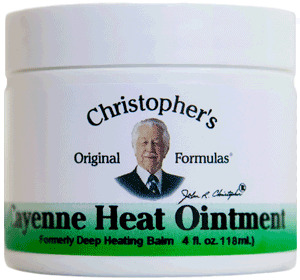 Dr. Christopher's time-tested Cayenne Heat Massage Oil aids with sore muscles, stiff necks & joint pain relief. Available in 4 oz. & 2 oz. sizes. Also available in Oil form.